L&A County Museum and Archives will host their fifth annual Christmas tree event on Dec. 11. 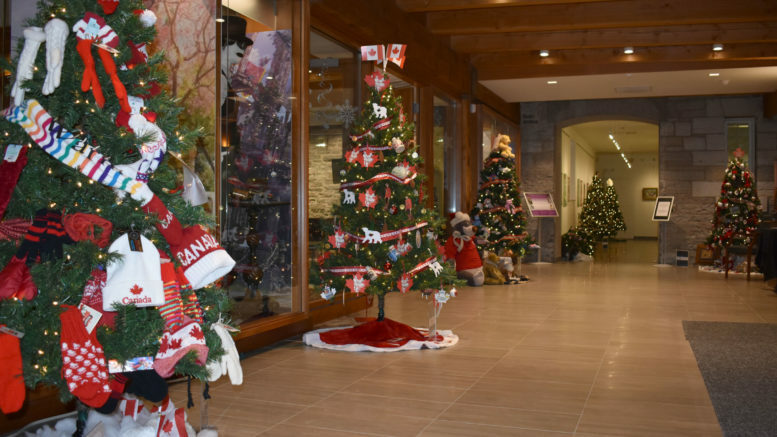 December will be a very busy season at the Lennox and Addington Museum and Archives with a full schedule of family events and activities. The fun begins this Saturday morning at 10 a.m. with a Museum Kids event titled The Night Before Christmas in the Dinosaur Museum followed by Ringing in the Holidays with the Grace United Church Bell Ringers later that afternoon at 2 p.m.
Dinosaur expert Betsy Cotton will return to the museum for the dino-themed event with a bit of Christmas magic mixed in. That also happens to be the title of a book she’ll be reading to the audience, once at the start of the event and a second reading near the end for those who miss the first one. Kids will also have the opportunity to make their own dinosaurs out of plasticine, explore a collection of dinosaur memorabilia, play board games, play with hand puppets, read books and colour in their own dinosaur mask. Admission to the Museum Kids Event is free. Following the dinosaurs will be the Grace United Church Bell Ringers, who will be performing their rendition of holiday classics. “Bell ringers are beautiful and they’re traditional and it’s just a simplified version of what Christmas music really entails,” said Meyer. Admission to the bell ringers event is $3. The following Saturday, Dec. 8, local wildlife photographer Bill Bickle will be at the museum from 1:30-3:30 p.m. answering questions about his exhibit, which is currently on display in the halls of the museum. He’ll also be sharing stories of his adventures to the great white north to photograph muskox and other arctic wildlife. “He’ll be talking about how to capture the perfect nature shot and his adventures and some of his exploration into the Canadian wilderness while he’s taking those photos,” said Meyer. Guests are also encouraged to bring in their own 4”x6” wildlife photo they’ve taken and share with Bickle how they captured that photo. Materials will also be provided to turn the photo into a Christmas tree ornament. The ornaments will be displayed on a special ‘Bill Bickle tree’, which will be part of the Christmas Tree Wonderland event which takes place Dec. 11 from 6 to 8 p.m. at the museum. Back for its fifth year, the event will feature 14 trees decorated by various community groups throughout the region. Guests will be able to walk though the museum and explore all the trees and then cast a vote for their favourite one. Father Christmas will also be at the event as well as live reindeer. Napanee’s own Hannah Barstow will be on hand to dazzling the audience with her jazz music. Among the trees will be a special ‘giving tree’, which is up to the public to decorate. Instead of ornaments however, they’re asked to bring hats, gloves, scarves and other warm clothing to donate to the tree. Clothing can be dropped off to the museum between Dec. 3 and Jan. 2, at which point the clothes will then be given to the Salvation Army.